I am Oglala Sioux. In the winter, I live with my people in the Black Hills. 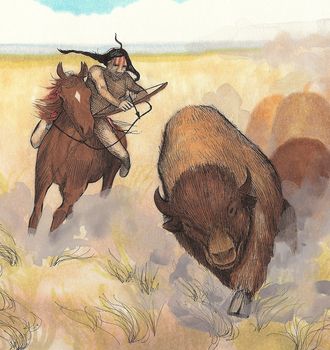 During the rest of the year, we make our home on the Great Plains. It is here that we hunt the buffalo that roam the Plains in large herds. We depend on these animals for our food, clothing and shelter. 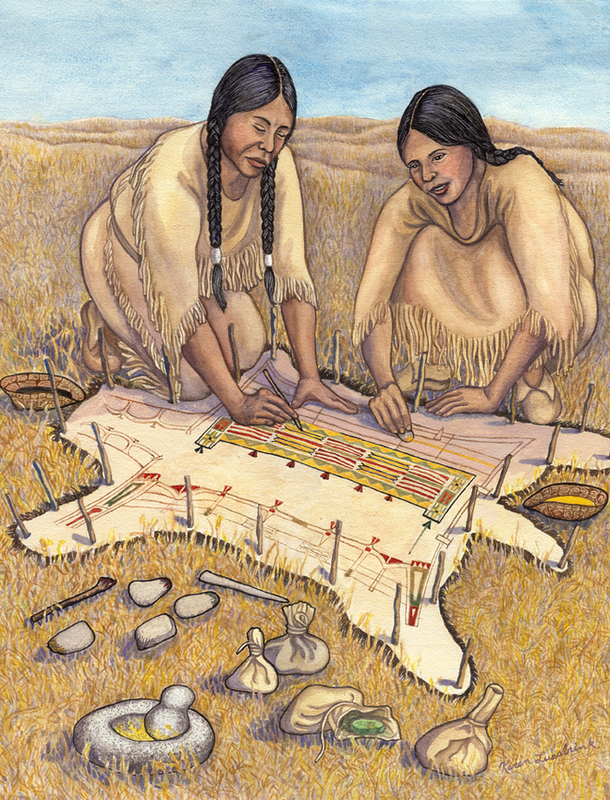 Summer on the Great Plains is a very busy time. We have much work to do. The men of our tribe spend most of their time hunting. This summer, they have killed many elk and buffalo. We women use raw materials from these animals to make clothing, tipi covers and many other things we need. The raw materials we use include skins, bones, sinew, brains and liver. Today, everyone rose as the eastern sky grew pale with the promise of morning. The air still held its nightime chill, and I shivered as I climbed out from under my buffalo-skin cover. Everyone had a job to do, and the camp buzzed with activity. 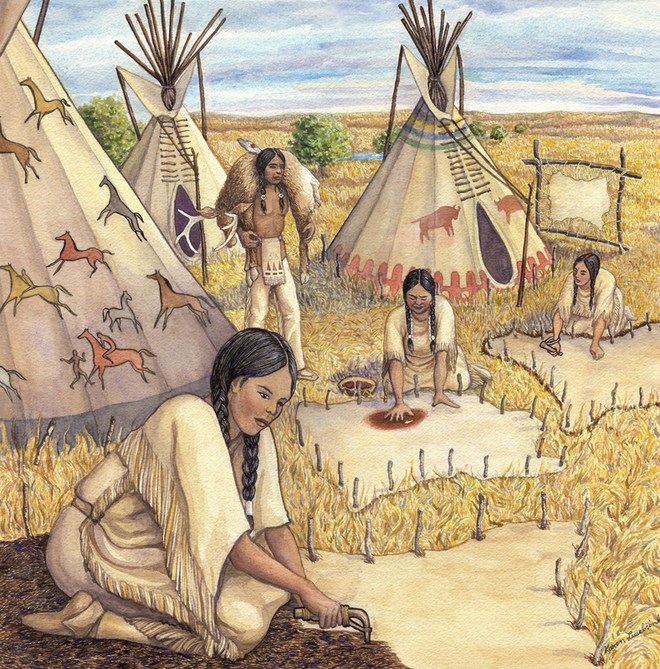 As the men prepared for the day's hunting, I gathered with the other women to work on the elk and buffalo skins. The work is hard, but I love the companionship and conversation of the other girls and women. Our mouths are as busy as our hands, and time moves swiftly. My job is to finish cleaning and preparing the skin of a buffalo my brother killed. I began working on it several days ago. First I stretched it on the ground and held it in place with wooden pegs. Then I used a fleshing tool to remove the flesh and fat. Next I soaked the skin in the river for several days. Soaking the skin helps to loosen the fur. When the fur was loose enough, I again stretched the skin out on the ground. Now I am removing the fur with a scraping tool. If I were making a winter robe, I would leave the fur on for extra warmth. However, I will use this skin to make myself a beautiful summer robe. After I remove the fur, I will scrape the skin again. This will make it thinner and lighter in weight. I do not want my summer robe to be too heavy or too warm. When the skin is clean, I will tan it. To do this, I will rub it with a tanning mixture made of the brains, fat and liver of the animals. Tanning a skin helps protect and preserve it. After the skin dries, it will be very stiff, and I will spend many hours rubbing it. Rubbing the skin will make it soft and pleasing to the touch. Then the skin will be ready, and I can make my robe. It will be just right to wear on cool summer evenings. A sudden thunder storm has forced us all inside our tipis. Now I have a chance to work with my grandmother. She is going to help me finish the pair of moccasins we started several days ago. Grandmother is highly skilled at sewing, and I can learn much from her. 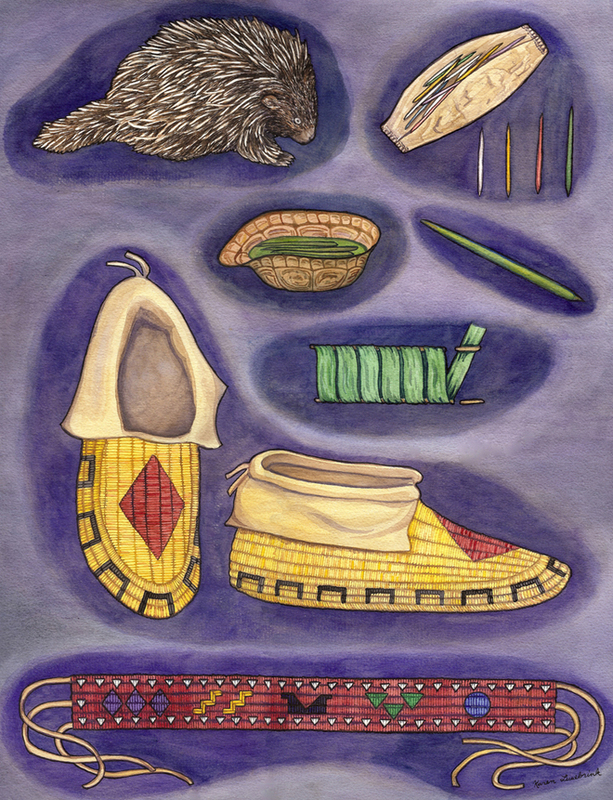 I asked for her help because I want the moccasins to be special. They are going to be a present for my brother. We started by cutting the upper part of each moccasin from a soft elk skin. Then we cut the soles, which must be thick and tough, from a buffalo hide. Next, we used a sharp, pointed tool made of bone and wood to punch holes around the edge of each piece of hide. The holes make it easier to sew the pieces together. While Grandmother sews, I make more thread from animal sinew. Whenever possible, I like to use the long sinew, or tendon, that runs along the backbone and shoulder of the buffalo. The sinew has been pounded and boiled to soften and clean it. To make a long thread, I join pieces of the moist, soft sinew by rolling them between the palms of my hands. Then I twist the end of the thread to make a fine point. When the point drys, it becomes hard. Then Grandmother can use the pointed end to guide the thread through the holes. She keeps the rest of the thread soft by moistening it in her mouth. Today, Mother and I are painting a buffalo robe. To make our paints, we collected berries, charcoal, clay and other colorful materials. We dried these materials, pounded them into powder and stored them in pouches. To prepare the paints we are using today, I took each powder and put it into a turtle-shell bowl. Then I mixed each color with a thin, gluey liquid made from the hide scrapings that had been boiled. I made the tools we are using from elk and buffalo bones. To make tools for painting thin lines, I filed the end of some bones to a point. To make tools for painting wide lines, I pounded the ends of other bones flat. Before we started painting, Mother helped me outline the design on the robe with a creasing stick. She is teaching me to arrange lines and circles in beautiful patterns. Men usually paint pictures of the things they see around them, such as animals, people and tools. However, it is traditional for women to paint imaginative, skillful and colorful designs. Sometimes we give each color a special meaning. Today we decided to use colors just because we like the way they look. When Mother and I finish painting, I will rub the design with the thick, sticky juice of a cactus leaf. When it dries, it will help seal and protect the colors. Grandmother is respected among our people for her skill in quillworking. I love the colorful designs she makes and want to learn to make them too. I began helping her when I was very young. First I collected and sorted the quills. Sometimes we would use bird quills but this time I am using porcupine quills. Then I learned to color the quills by soaking them in colored liquids. I made these liquids by boiling colorful flowers or berries in water. Next Grandmother taught me how to flatten the quills. 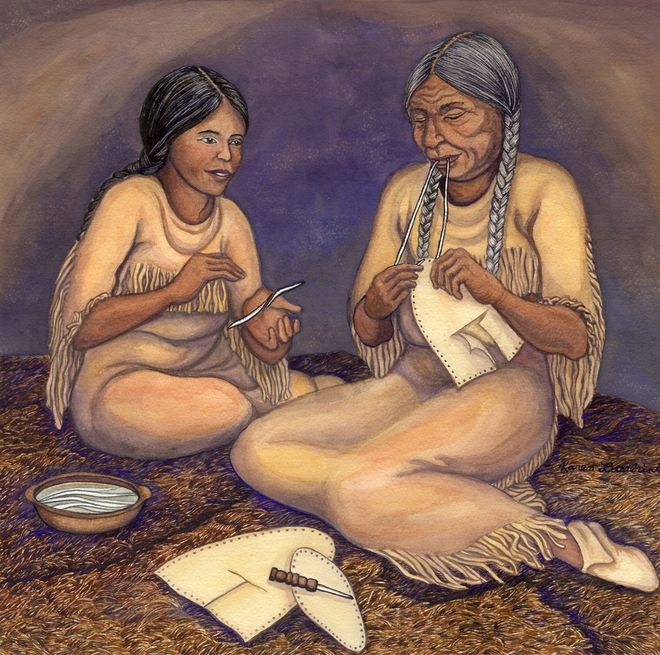 Now she is helping wrap the quills around the threads I have sewn on the moccasins. She says I am becoming more skilled with each project I complete. It is winter now, and we have more time for quillwork. I have just finished the moccasins I was making for my brother. I gave each design a special meaning. The diamond is for the feathers he will earn for many brave deeds. The color yellow is for the power and strength of the sun. The black hoof prints stand for the many horses my brother will capture. For myself I made a belt. On it I created designs to tell the story of an adventure I once had. The diamonds are the whirling wind. The triangles arond the edge stand for the rain. The zigzag lines are the lightning. The shape in the middle is the storm. The three upside-down triangles represent the tree that filled me with terror when it fell. 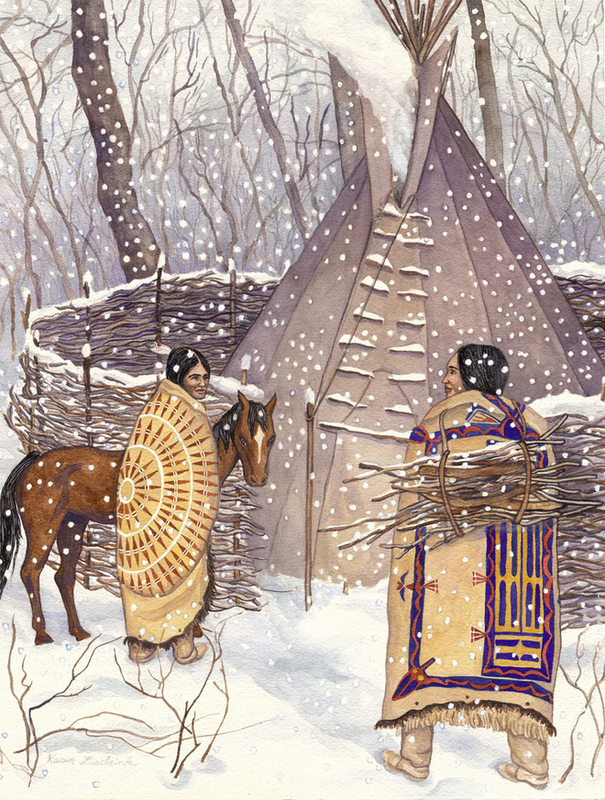 The circle represents both my village and the warm, welcoming fire of my family's tipi. Winter winds blow cold and send the snow dancing through the Black Hills. My brother has been out all day hunting with Father and the other men. The have been looking for food for our people. As I walk back to our tipi carrying a bundle of firewood, I meet him. He has just returned from the hunt. Because it is so cold, he is bringing his favorite pony into camp. He will tie it near the windbreak around our tipi. This will shelter and help protect the pony from the bitter wind. I know by brother was protected from the cold today because he is wearing leggings, fur-lined moccasins and a robe I made for him. Bundled warmly in my own leggings, fur-lined moccasins and buffalo robe, I think of the long hours I spent sewing last summer. I now know it was time well spent. It is spring now, and we are preparing to leave the Black Hills. The entire tribe is gathered to witness an important ceremony. It is being held to honor a band of brave warrious, the Kit Foxes. Their daring and courage have earned them high honors. With these honors come great responsibility. The Kit Foxes must enforce our laws and keep order when our tribe moves from one camp to another. My excitement is great as I wait for the ceremony to begin. My brother belongs to the Kit Foxes, and I am very proud of him. The song of the Kit Foxes describes how he and the other warriors feel about their position. It is our chief who has chosen the Kit Foxes for this honor. The special shirt my brother wears is a symbol of his high position. The color blue symbolizes the sky, and the color yellow symbolizes the earth. The hair fringe on the arms represents the people of our tribe. Only very generous and wise men can become Shirt Wearers. They must be good leaders, for the well-being of the tribe is in their hands. Today, my brother is going to make a shield that he will carry for protection. He will make it from the skin of the neck of a buffalo. He invites his best friends to join him and assist him in the making of his shield. He first digs a hole in the ground as wide as he wants his shield to be. In this pit he throws in stones and builds a fire to heat the stones. He stretches the skin over the fire pit and holds it with pegs he drives through the skin and into the ground. He leaves a little space between the skin and the ground to let out the smoke from the fire. Next he pours water on the hot stones, which creates a loud hissing sound. The steam heats and softens the buffalo skin. As the skin softens, he scrapes the hair off the skin. While he is working on the skin, my brother's friends sing while dancing in a circle around him. This is important as they are calling on the Great Spirit to send power to the shield to protect my brother from his enemies. As the skin heats up from the fire and steam, my brother spreads glue on the hide. The glue is made from the hooves and bone joints of the buffalo. Soon the skin begins to shrink from the heat and the glue. It begins to pull the pegs out of the ground. Quickly his friend drives more pegs through the skin in front of the pegs that are giving way. It is important to keep the skin tight across the hole as it shrinks and thickens from the glue. When the skin is as hard and as thick as my bother needs for good protection from flying arrows, the dance ends, and they put out the fire. Next my brother spreads the skin over a pile of small stones. As it cools and dries, the skin will become hard with a curved shape. When the skin is cool, my brother takes a piece of charcoal and draws a circle around the skin to mark the shape of his shield. Then, he trims the skin around his marked pattern to form the edges of his shield. Finally my brother pounds the hide of the shield to smooth it out and create its final rounded shape. When the shield is finished, he takes his friends into the forest where they shoot arrows at it. This is done to test the strength of the shield and ensure its protection from the flying arrows of his enemies. When my brother returned to camp, he annouced that his shield had passed the test. I gave him some of my colored paints so he could draw a buffalo on his shield. My people believe that this buffalo will guard and protect him from harm. For two days my brother and his friend were away from camp. They had ridden off on their fastest ponies while deep night covered the forest and hills. I began to worry because I knew they had gone to seek a dangerous adventure. Yesterday, the rising sun brought a great surprise with its warming rays. My brother and his friend returned with horses they had captured from a wild, roving herd. My brother came back with two and his friend had three! This was a great triumph because horses are very highly valued by our people. After my people and I admired the new horses, a feast was prepared to honor my brother and his friend. Before the feast, we all listened to the story of their adventure. Then everyone praised them for the courage and skill they had shown. These are important qualities for young men to demonstrate. 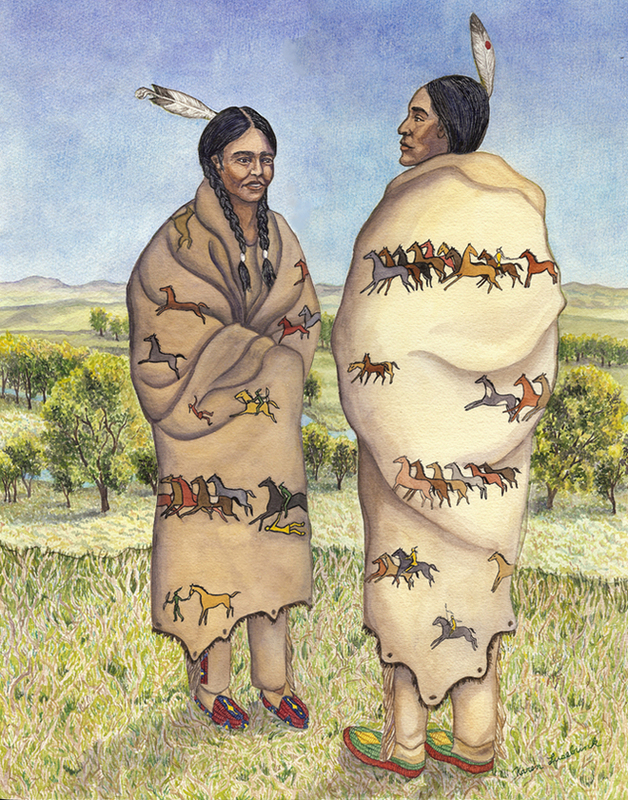 Today, my brother and his friend painted the story of their adventure on their buffalo robes. Whenever they wear these beautiful robes, people will be reminded of their skill. Even strangers will know that they are courageous men. 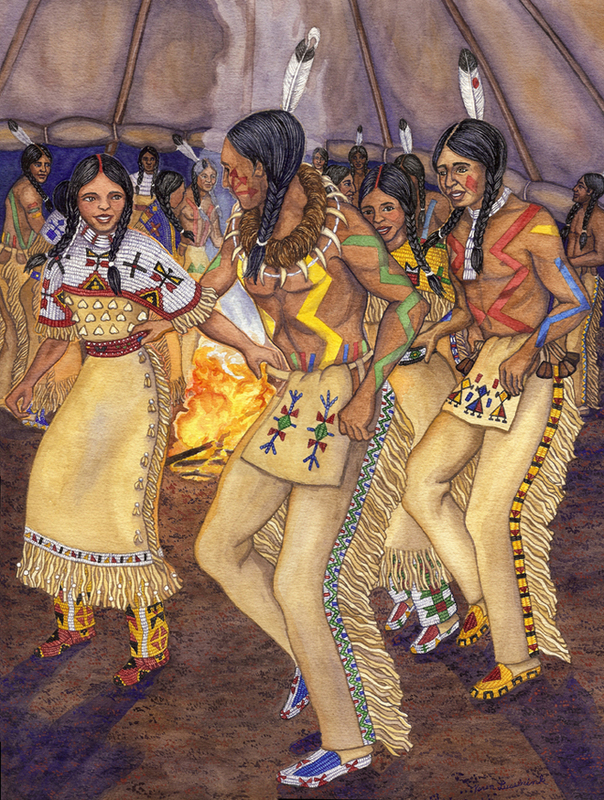 The Night Dance, held on a warm summer evening, is a special occasion for the young people of our tribe. Everyone wears his or her finest clothes. I am wearing my best dress. 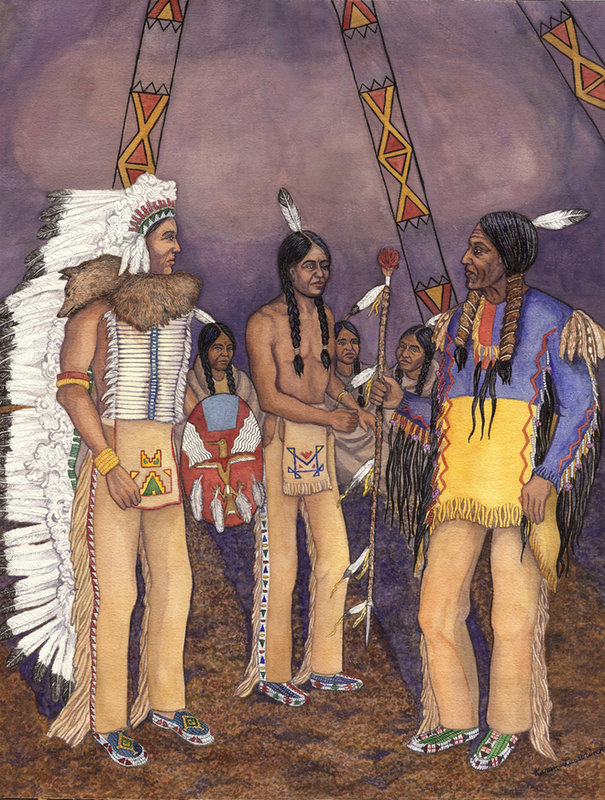 It is decorated with red, white, yellow and black quillwork, elk-skin fringe and elk teeth. I am also wearing my favorite leggings with their beautiful quillwork designs. The men have tied ornaments in their hair and painted colorful designs on their bodies. Some have also tied elk hooves to their belts. The hooves make a lovely tinkling sound when the men dance. Though the Night Dance is a special courting dance for young men and women, the whole village joins in the festivities. The children and older people do not dance, but they enjoy watching the young people. This is one of the few occasions when women and men dance with each other, rather than in separate lines or circles. Yesterday I overheard my brother talking with his friend, who said he wanted to dance with me. Hearing this made me happy, for he is my first choice as a partner too.